A rhinoplasty, also called a “nose job” or nose surgery, is a procedure for patients who are dissatisfied with the size or shape of their nose. Other patients may be having trouble breathing due to a deviated septum and wish to undergo a septoplasty, which is designed more for functional correction than cosmetic purposes. Many people who are interested in a rhinoplasty have been unhappy with the size and shape of their nose for years, and others may be having issues after an injury. Either way, since the nose is placed right in the center of the face, it is often the most noticeable facial feature and is impossible to hide. If a patient does not like the way their nose looks, it can have a drastic effect on their self-esteem. A rhinoplasty can reshape the nose, making it more aesthetically pleasing and providing a boost to the patient’s confidence. A deviated septum can cause breathing issues that will have a significant impact on the patient’s quality of life. Sleep apnea, nosebleeds, and frequent sinus infections are just some of the issues caused by a deviated septum. A septoplasty, which involves an approach similar to that of a rhinoplasty, helps to remove any blockages in the nasal airways to improve breathing and remedy congestion that can cause infections. A nose surgery is one of the few procedures that can provide cosmetic and functional improvement at the same time. Many patients desire a change in the shape or size of their nose but also need to address functional issues within the nasal passages. Dr. Hochstein is an experienced surgeon who can help you address these issues to give you a nose that is both beautiful and functional. During your consultation, he will examine your nose and discuss your concerns with you to determine what the best approach will be. 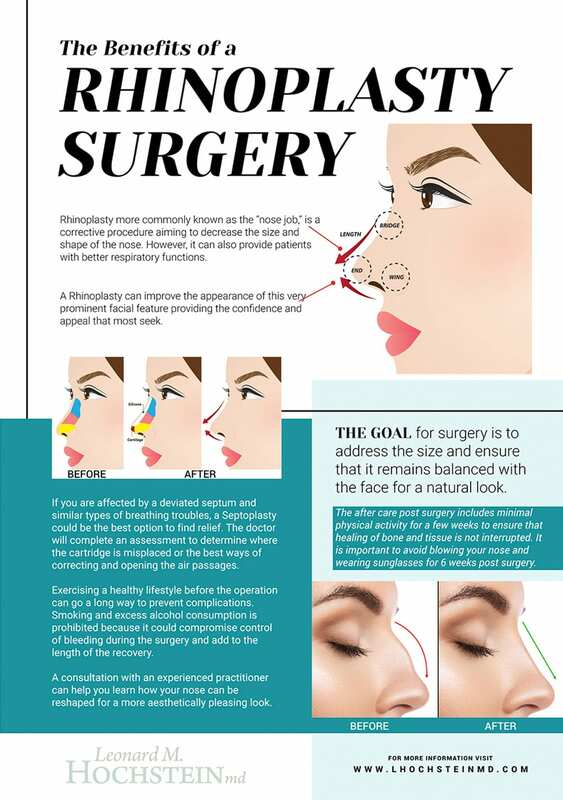 If you are interested in a rhinoplasty, contact our office online or call (305) 931-3338 to schedule a consultation.